Thursday afternoon. I received a call from Mike, the shop foreman at a fluid management company in Canada that designs, builds, and operates systems for construction and mining projects. Mike said that he had a large hydraulic system which needed some major oil filtering. He needed a permanent in-line filtration system to be installed. The hydraulic oil that needed to be filtered was MV46 Petro Canada, which was going to be pumped by a submersible pump. 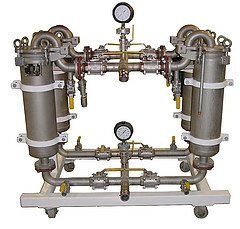 The system needed to operate at a very high pressure and flow rate: 1450 PSI at 200 liters per minute (approximately 50 GPM). They wanted to remove from the oil both water and particulate down to 5 micron in size. Based on the high pressure, I knew he needed a pretty heavy duty filter housing to handle that type of pressure… the question was how big. Mike also wanted to have a “dual setup” where the first stage would remove particulate and the second stage would remove water. The key was to match the 2″ NPT connection that he needed to match the size of his hoses. With the help of our engineering team I was able to narrow in on a few high-pressure filter assemblies that could handle that 1450 PSI. 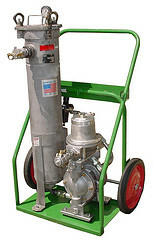 I eventually chose our base-ported pressure filter (PDF) because it can handle the high-pressure required. Its housing base and cap are made of ductile iron and it has a carbon steel case for its filter element. It also had a 2″ NPT connection, which is exactly what Mike needed. 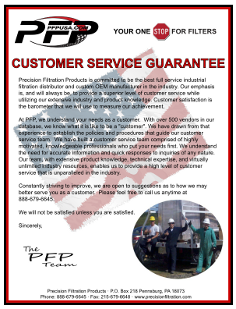 Once we provided him with a price quote, we were able to deliver the equipment within 4 weeks. I spoke with Mike after he received the housings and he ordered additional replacement internal filter elements. Since then he has been obtaining oil quality samples and he has reported that he is very happy with the results. 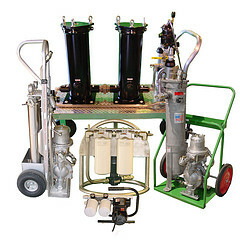 Do you have a question about high-pressure filtration systems or how to filter lube oil? Feel free to contact us anytime. Our friendly team of experts will be happy to help you out with your particular issue.